Robert Mondavi Twin Oaks® takes its name from the renowned Lodi Wine region California. Established nearly 20 years ago, Robert Mondavi Twin Oaks® highlights the distinctive quality of the Lodi California Wine region – an area ideal for growing premium wine grapes. 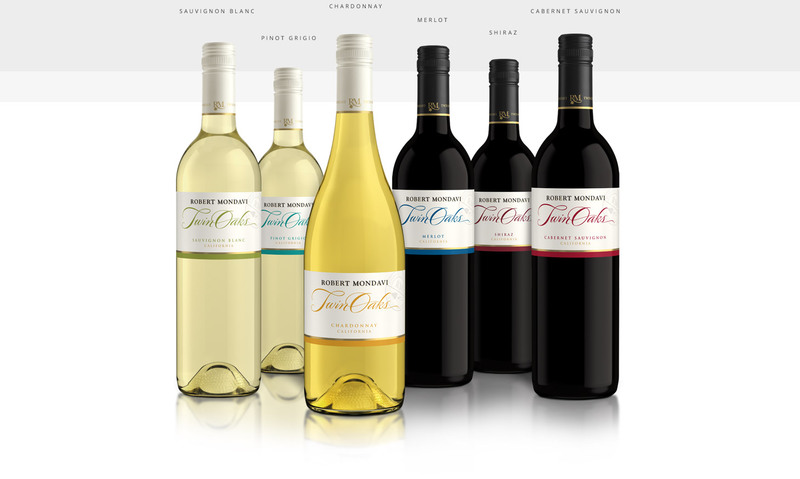 In keeping with the vision of Robert Mondavi himself, the wines are carefully crafted to give emphasis to fruit expression and flavor, resulting in clean and easy to drink wines, ideal for everyday enjoyment. Sandals Resorts is always looking to raise the bar when it comes to the Luxury Included® experience to our guests. This exclusive partnership with Robert Mondavi Twin Oaks® raises the standard of the "included" wines poured at all inclusive resorts. Our Cabernet Sauvignon opens with aromas of cherries, berries, cedar, brown sugar, and toast. Flavors of berries, toasted marshmallow, chocolate, and graham cracker follow with a toasty caramel finish. Our Merlot displays rich aromas of cherry, chocolate, and red berries with enticing flavors of cherry cola and toasty mocha oak. This full-bodied wine possesses well-balanced acidity and beautifully integrated tannins, creating complexity and structure. Its soft, versatile style complements grilled meats, especially steak, pork chops, and hamburgers. Enjoy this savory wine with hearty pasta with Bolognese sauce. Our Shiraz has wonderful flavors of berries, chocolate, and spice. There is a bright acidity that balances out the wine’s full tannins, making this Shiraz easy to pair with a variety of dishes. Aromas of blackberry and rose leading to a light black pepper finish make this lively wine enjoyable with a variety of meat dishes–from slow-cooked BBQ beef brisket to a grilled London Broil. Intense citrus, lime, and fresh peach aromas lead the way into our refreshing Pinot Grigio. Full, round citrus fruit flavors and a crisp finish. A food friendly wine, originating from the northern coast of Italy, Pinot Grigio has long been known for its ability to pair well with seafood and other light dishes, such as poultry and a variety of cheeses. Enjoy our Pinot Grigio slightly chilled. With crisp, bright, refreshing acidity and tropical aromas, our Sauvignon Blanc is a fruit-forward wine that shines alone and alongside food. A lovely accompaniment to seafood and light chicken dishes, our Sauvignon Blanc is a perfect complement to seared scallops over linguine. The wine’s bright style also pairs nicely with warm-weather dishes such as fresh spring salad with chèvre and fresh appetizers such as oysters and crab cakes. Enjoy our Sauvignon Blanc slightly chilled. Our Chardonnay opens with yellow apple, cinnamon-caramel oak, and slightly floral aromas. The apple, peach, and warm oak flavors of this clean and crisp yet silky Chardonnay pair perfectly with hearty dishes such as roast chicken with white truffle risotto and tuna noodle casserole. Best served slightly chilled.